Like the 2025 Comprehensive Plan, Ada County’s 2007 Comprehensive Plan defines preservation of farmland, open space, and critical wildlife habitat as priorities. Along with the Boise River, Table Rock, and Snake River Canyon, Dry Creek is listed as an area of special preservation importance. Below is a list of highlights from the 2007 Comprehensive Plan, our comments are found in bold. We argue the approval of the Dry Creek Ranch subdivision goes directly against Ada County’s own goals, policies, and priorities. THE DRY CREEK RANCH SUBDIVISION DOES NOT ADHERE TO ADA COUNTY'S 2007 GOALS, POLICIES, AND PRIORITIES. "Planned Communities are required to include a mixture of compatible land uses, provide for connectivity within the community, and conservation of open space, and incorporate integrated design themes for all aspects of the community. They should have a high degree of self-sufficiency, particularly when located outside of areas of city impact, including funding the provision and ongoing operation of all essential public services, and include or be in close proximity to a wide variety of commercial and community facilities. Planned Communities are required to place an emphasis on community character, creating a sense of community. They are expected to be innovative in their approach to site planning and development." NOTE: The Dry Creek Ranch project will not be self-sufficient, as it will rely on surrounding cities like Boise, Eagle, and Meridian to provide basic public services. It will not provide trip-capture, as residents will be required to leave the community for shopping, entertainment, and work commutes. For these reasons, we believe the project proposed by Boise Hunter Homes is not a planned community at all, but rather a large-scale subdivision and it should be considered such by Ada County. With large lot sizes and expensive homes, it is not smart or innovative growth. We would like to see Boise Hunter Homes recognize the intrinsic value of the Dry Creek Valley in our community and choose to build elsewhere. "Protection of land with prime agricultural soils. Much of the County’s prime farmland has been lost to residential development or other uses during the last two decades. Future population growth will continue to put pressure on agricultural land and businesses. Concerted efforts to protect this resource will be needed if opportunities for future agricultural operations is a county priority." Policy 12.13-4: Protect agricultural activities from land use conflicts or undue interference created by residential, commercial or industrial development. "Preservation of open space. Ada County residents value open space as a resource for recreation, visual relief from the built environment and habitat for plants and wildlife. Open space can be preserved through a variety of means, including regulation of areas with sensitive resources, development and design guidelines and possibly purchase or transfer of development rights or land." "Preservation of open space in rural Ada County. If the County is to retain areas that are non urban, then new approaches to development and regulation, as well as incentives, are needed in rural areas to prevent similar conflicts in the future." "Loss of potential open space through development. Much of the County’s open space is being consumed as land is developed for housing and other uses. If the County is to retain the open space that helps define it and provide recreational and other opportunities for residents and visitors, it will be essential to identify key open space resources and plan for their conservation before or as development occurs. In part, this can be accomplished by requiring provision of passive open space through the development of Planned Communities, as currently required by ordinance, and other areas." Policy 5.6-1: Encourage preservation of open space and a rural residential lifestyle with limited development in areas that cannot reasonably be served by central sewer systems. Policy 12.13-1: Promote the protection and conservation of important natural areas, fish wildlife habitat, historic resources, and open space throughout the County. "Historic and cultural resources. These resources help define Ada County’s identity and also are important to residents to preserve and manage as growth and development occur. Schick-Ostolasa Farmstead. 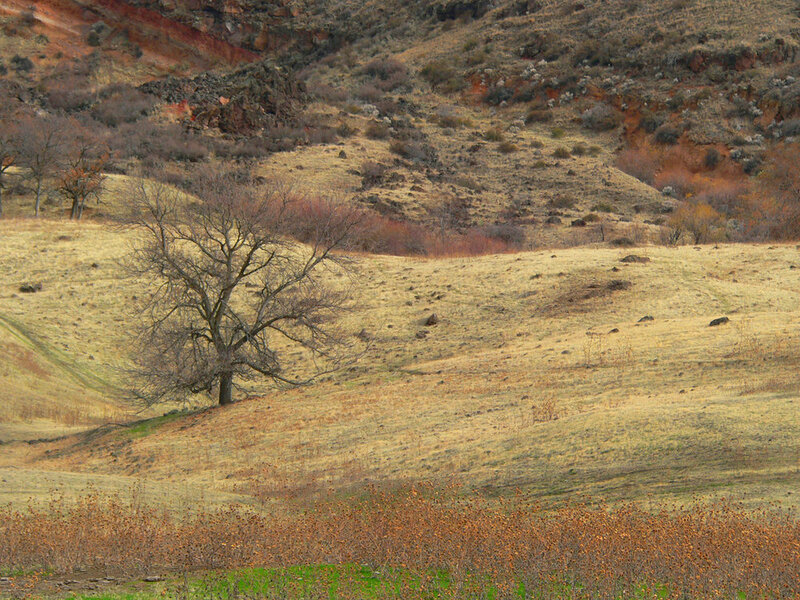 The Farmstead lies on about 1.75 acres of land along Dry Creek. It includes a 2-story farmhouse with barns and other outbuildings. Members of the Schick family lived in the house from the 1860s until 1920. In 1927, the family of Costan and Lucia Ostolasa moved into the farmhouse where their descendants lived until 2005. The farmhouse was listed in the National Register of Historic Places on August 23, 2006." Policy 10.1-1: Encourage the rehabilitation and retention of existing historic structures in Ada County. Policy 10.1-5: Review proposed developments to determine if they would destroy or impact any unique geological, historical or archeological site and to identify what steps may be needed to avoid or reduce negative impacts to the site. Provide a design review process for new construction impacting historical sites to encourage compatibility of design. Policy 6.1-4: Minimize development allowed within critical winter range areas, the wildlife habitat of federal and state listed or sensitive species, rare plant species, and/or minimize the impacts of development on those areas. Policy 6.5-3: Development adjacent to Wildlife Preservation Areas should minimize and/or mitigate adverse impacts to critical wildlife habitat. Development may be denied, density limited or density transferred where critical wildlife habitats exist as defined in 6.5-2. "Implementation Action. Update the County’s zoning ordinance to require applicants for large developments such as PUDs and large subdivisions to prepare wildlife protection and mitigation plans as appropriate, similar to existing requirements for Planned Communities. Require that such studies undergo a peer or independent review prior to approval." WildLands Defense argues that the “Wildlife Mitigation” proposal by Boise Hunter Homes is insufficient. Policy 12.6-1: Encourage the location of high density and affordable housing near public transportation, shopping and urban recreational areas. Policy 12.11-1: Use zoning and other planning approaches to encourage the location of high density residential development, major commercial and employment areas, and new parks or other recreational or cultural amenities in areas that are easily accessible via public transportation. Policy 2.1-1: New residential development should occur within each community’s Urban Service Planning Area (i.e., Areas of City Impact) or other areas that primarily have existing or planned services to accommodate growth. NOTE: The Dry Creek Ranch subdivision does not offer high density, affordable housing near public transportation, shopping and urban recreational areas. It does not occur within the Areas of City Impact. It is not easily accessible via public transportation and it will place a major traffic burden on the area. In a time when alternative modes of transportation are encouraged, this heavily-automobile dependent subdivision is not forward-thinking or responsible. Houston suburb photo provided by Nelson Minar. Thank you!